This lesson aligns with three standards in the NSES: risks and benefits; personal health; and structure and function in living systems. The chart below shows how the activity aligns with these standards. Personal health Students learn the short- and long-term effects of using marijuana. Students can use this information to influence decisions that affect their own health. 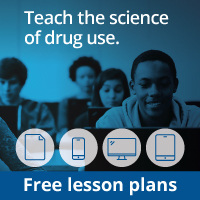 Structure and function in living systems Students will learn how marijuana acts in the brain and how marijuana can ultimately affect the brain and body.